Coaching is one of the essential skills required for a Scrum Master to be effective. 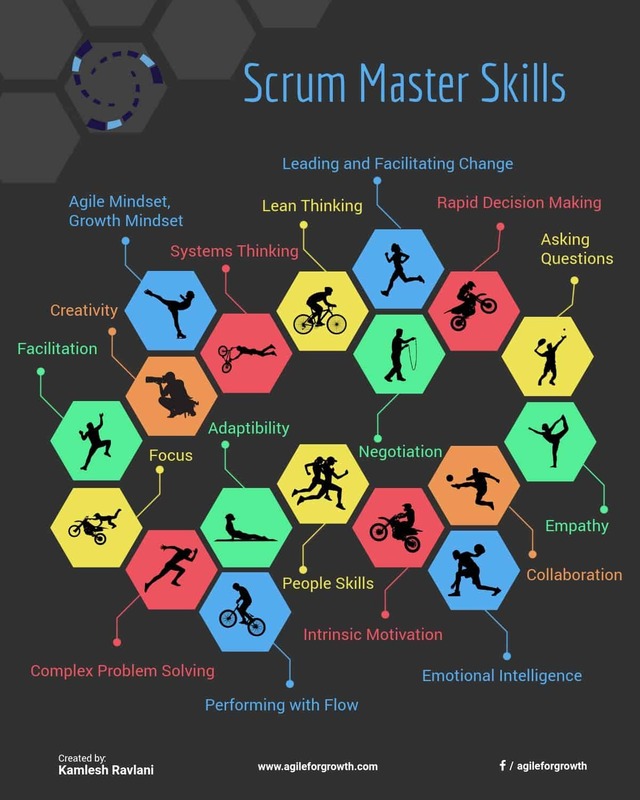 Coaching along with Facilitation and Teaching skills enable the Scrum Master to perform their role effectively. The Scrum Master coaches the Development Team, the Product Owner, and the Organization. Coaching brings out the best in them. A coach helps in unleashing a person’s or a team’s latent potential. This helps to maximize performance with the same amount of effort. It's about empowering the people to learn rather than teaching them. The Scrum Master as a coach helps the Scrum Team as well as the organization, adopt Scrum and enhance enterprise agility. Coaching is a collaborative intervention used by a coach to help their coachee(s) to improve and move forward towards a better behavior and goals. Unlike mentoring, counseling and educating, coaching doesn't need the coach to have all the answers or to be a subject matter expert. The coach creates a structure and a safe environment where the coachee can be open and vulnerable to experiment and eventually grow. While coaching, the Coach helps the coachee to clarify the challenge they want to address. Staying neutral, the coach holds the structure, a safe place within which the coachee can go through the transformation. Coachee addresses the challenge at hand. In the process, coachee develops capability and is on the way to attain a better future. > asks powerful questions: empowers coachees to find their own answers rather than giving them the answers. > actively listens with an open mind: allows the coachees. to reflect and bring clarity to their thoughts. > reflects back: enables coachees to become aware of their own thinking, behavior and actions. > challenges thinking: leads the coachee out of her comfort zone, motivates to break limiting mental patterns. > helps the coachee look at their blind spots: saves them from making costly mistakes. > helps the Scrum Team and the PO develop focus and avoid distractions. > helps the Scrum Team discover their values and purpose. > helps establish clarity of thoughts/objectives: reduced ambiguity helps the team with rapid decision making. > Develops her coachees to find and activate their inner coach to sustain the coaching momentum after the formal coaching is over. > Maintains neutral stance while maintaining the structure for the coachees to lead the action. > Is able to observe blind spots and holds a mirror for the coachee to see the same. Establishing a Trust based Relation: A pre-requisite for an effective coaching is a relationship based on trust and respect. A trust-based relation allows the coachee to be vulnerable, feel safe to discover their potential and transform to get better. In the presence of trust, team members can open up and share their mistakes. Failures become learning opportunities, and it is easy to seek help. When people have built relationships, getting things done becomes smooth. The focus can stay on making positive progress. Collaboration becomes a natural way of working when team members enjoy working with peers. Scrum Master achieves this is by creating an environment of radical transparency. Transparency of information improves trust. Scrum Master ensures the Scrum values of commitment, courage, focus, openness, and respect are embodied and lived by the Scrum Team. Scrum values foster trust among all. The Scrum Master acts as a bridge to establish trust based relationship. Generative Listening: The success of all coaching conversations depends on the ability of the coach to listen deeply. It requires practice to listen to what people say. But to be able to listen to what is, it takes a whole lot of letting go. Such as shedding the internal biases, personal agenda, the need for winning, and silencing the inner self. This level of listening requires being in the moment. The coach with an open mind listens to what is being said and strives to understand the deeper meaning and emotions behind those words. By being open the coach allows for the future possibilities to emerge. Generative listening is listening with a purpose to serve, it has empathy, openness and allows possibilities to emerge. Let's think for a moment. You are the Scrum Master coaching a Manager. You carry an internal bias about this person's attitude, their management style, and have a preplanned agenda you would like to push. Will you be able to effectively coach this manager? Irrespective of this manager's willingness to learn, the coaching intervention will not help the manager, if the coach isn't listening. 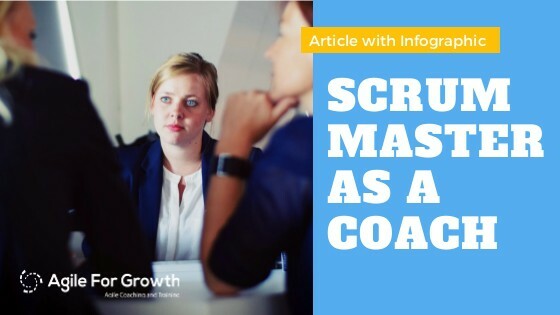 The Scrum Master allows space for the coachee to talk and discover her capabilities. To come up with answers and solve their own problems. This allows the coachee to sustain their growth and accomplish highest future possibility. Powerful Questioning: The Scrum Master uses powerful questions to fuel coaching conversations. The Scrum Master learns and practices this art of asking questions. A powerful question is unbiased, clarifying, open-ended, inviting, challenging, solution focused and empowering. By moving away from telling, answering and solving, the coach takes a stance of asking powerful questions. Find dozens of powerful coaching questions I've posted on my Linkedin and Twitter profiles. Leading by Example: To be able to earn trust and influence others, the Scrum Master must exhibit behaviors that she so desires from her coachees. A good coach has a learning attitude, welcomes feedback, continuously works on improving herself, is flexible and is comfortable to experiment and fail. If the Scrum Master isn't a servant leader herself, will she be able to effectively coach the organizational leaders to become servant leaders? The Scrum Master by practicing agile mindset instead of simply preaching it inspires others to continuously improve their agility. Focusing on the Present: What helps people move forward and make progress is living and acting in the present. It’s not uncommon for many people to carry the baggage of negative experiences of past with them. Such baggage not only drags them down from moving forward but also usually prevents them from trying new things. On the other hand, you’ll also find people living in the fantasy world of future, having grand plans which try to perfectly lay out everything. Most assume that everything will be awesome one day – by itself. A good coach lives in the present and helps the coachee make the best of the opportunity at hand, accept the present and adapt to the situation at hand by taking action in the now. Acknowledging the coachee as Whole and Resourceful: This comes from Co-Active Coaching approach that emphasizes that – People are inherently whole and resourceful. They don’t to be fixed. If the Scrum Master accepts this she will be able to allow the coachee the freedom and empowerment to find their own solutions. She challenges constructively, provides structure, constructive feedback and avoids criticism. Being a Servant-leader: The Scrum Master as a Servant Leader operates from the stance of serving others. Serving the Scrum Team is an essential responsibility of a Scrum Master. The Scrum Master models servant-leadership behavior that inspires others. She focuses on serving team's agenda and not own agenda. Her objective is to be able to serve her people, empower them and help them build the capability to deliver the best they possibly can. Why does a Scrum Master act as a Coach? 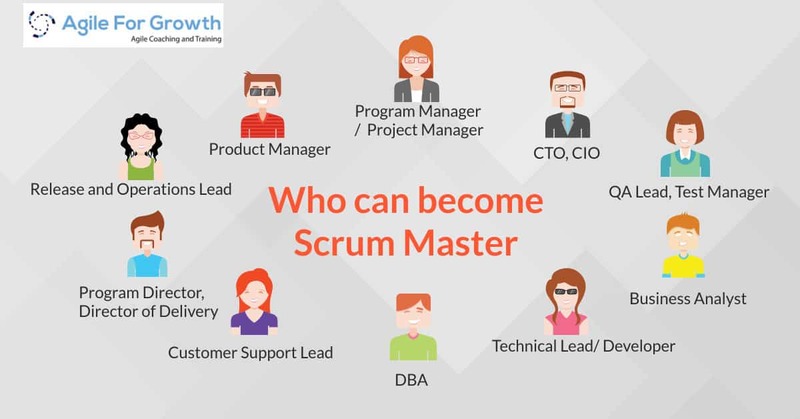 The Scrum Master is responsible to help the team grow to be a cross-functional and self-organizing team and derive maximum benefits of adopting Scrum. Moving from traditional functional silos and top-down driven teams to cross-functional and self-organizing teams requires a major shift in the behaviors of people, in the organizational structure as well as culture. Coaching is the best intervention to accomplish deeper and sustainable change in the way people think and behave. The Scrum Master brings a thorough understanding and practical application of the Scrum values, the Scrum framework and its rules. This knowledge and experience informs the Scrum Master to identify the most appropriate intervention for the context. Coaching being one of that intervention in the Scrum Master's toolbox. While the Product Owner is responsible for improving ROI through Product direction, the Development Team is responsible for translating the Product Owner's vision into working product and delivering high-quality product increment, the Scrum Master is responsible for building the capability within the Scrum Team to maximize the value it can deliver. Since the Scrum Master is not responsible for product direction, delivering the product and people management, she can observe the action on the ground as well as step back to view it from a 30,000 feet view. Allowing her an opportunity to bring back observations and insights which may be blind spots for the team. If the Scrum Master observes the Scrum Team derailing from any of its own goals, she can help them get focused and quickly help them channelize their effort to reorient the Scrum Team toward meeting the bigger organizational goal. Prepare for the coaching conversation - Scrum Master should prepare before for the coaching conversation. Be open, shed any bias towards the coachee, understand the context within which the coachee operates. Come to the coaching conversation with full enthusiasm and positivity. Learn about the customer’s need - Ask the Dev Team, the PO, and the stakeholders and learn what is their desired outcome. What positive future they intend to create. Most coaches miss this aspect and jump straight into solving problems they see on the surface. Avoid the trap of being and showing yourself as busy. Not all running is reaching. Understand the desired destination first, before you start running towards it. Establish the environment of safety and openness - A fundamental pre-requisite of a good coaching conversation is an environment of mutual trust, safety, openness, and privacy. It's an unspoken contract between the coachee and the coach. It is the responsibility of the coach to establish such environment before the coaching session begins. Only when the coachee feels safe enough they will open up and take the position of vulnerability which paves way for their further growth. Accept expected behavior - A major portion of Agile Coaching involves helping people bring a change in their behavior. Before starting the behavior change, understand that most people’s behavior is a reflection of what is expected of them in the organizational environment. People mostly Accept the current behavior of the team members, the PO and people within the organization — Before starting the behavior change, you must first, without judgment, accept that the current behavior of team members and managers is mostly a reflection of the expected behavior in the current organizational environment. Simply stating a particular behavior is not Agile will not help your coachees. Help them see their behavior from a different angle and let them decide what they would like to do the same. Specify behavior change - Accepting the current and expected behavior does not mean, your coachees should continue with the same behavior. The Scrum Master helps coachees understand the need for the behavior change as aligned with their own transformation goals. I was the new Scrum Master for Pluto team. The developers on this team would not mind if any stakeholder would come up to one of the team members, pull them out and assign them random tasks. They would miss a story or end up working extra hours to finish the sprint plan. Surprisingly they will not bring up this at the Sprint Retrospectives either. At the end of one retrospective, one team member asked for my input when they missed delivering two stories. I asked if this was of interest to any other team member as well - most showed interest. We agreed to have this discussion with the team the next day. I invited them to take a couple of minutes and self-assess the team on how they were doing on the Scrum Values. They were quick to come back with observations stating "We need to show Courage and stay Focused on delivering the Sprint Goal." I supported their observation while emphasizing that it was essential that every team member ensured that they followed all the Scrum values well. Embed new behavior - It helps the team, the PO, and other people within the organization to embed new behavior in their daily way of working. The Scrum Master may facilitate the same. Hold the people accountable to continue making efforts. Challenge them if they slow down or feel exhausted as the new behaviors may require additional cognitive processing and discipline. The team may need a couple of reminders and bit of experiences that embed this new behavior. Like any change, make this change small and incrementally build up. I like the PLEASE coaching model for its simplicity and effectiveness. What's important is that it works for me. I've refined it over the years to be simple yet powerful. 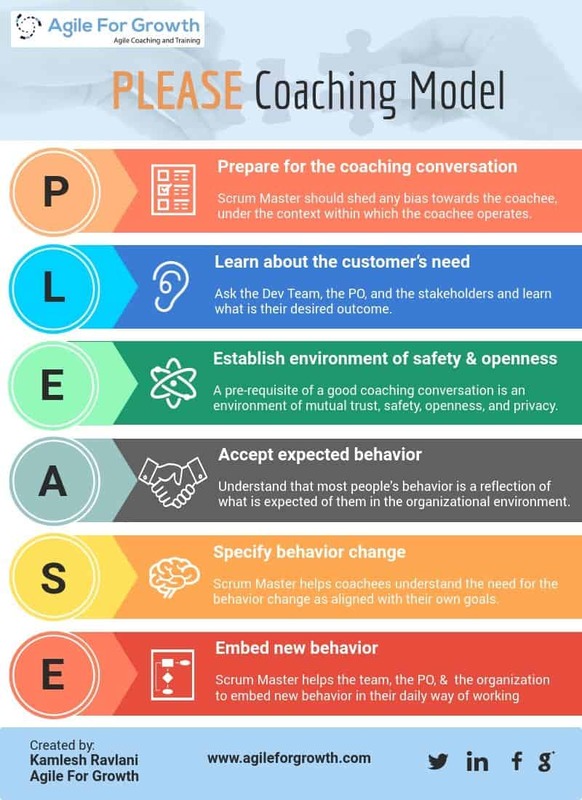 If you are a Scrum Master and would like to use the PLEASE model in your coaching, give it a try. Feel free to reach me with your experiences applying it. There are other coaching models that the I've applied based on the need and context. SCARF stands for: Status, Certainty, Autonomy, Relatedness, and Fairness. In the video below, David Rock the creator of SCARF model, explains the neuroscience behind it. SCARF model involves five domains of human social interaction. It originated based on key discoveries in the field of Neuroscience about the social interaction among people. 1. The human brain treats social threats and rewards with the same intensity as physical threats and rewards (Lieberman, & Eisenberger, 2009). 2. The capacity to make decisions, solve problems and collaborate with others generally increases under a reward response and decreases by a threat response. (Elliot, 2008). 3. The threat response is more intense and more common. It often needs to be carefully monitored + minimized in social interactions (Baumeister et al, 2001). What are the responsibilities of a Scrum Master as a Coach? The Scrum Master supports and enables the dev team, the PO, and the organization through coaching to deliver the highest value to the customers, improve the ROI and develop adaptability within the organization. Let's explore how does the Scrum Master coach each of the roles? The Scrum Master may spend significant time and effort coaching the development team. More so where serving a team new to Scrum. 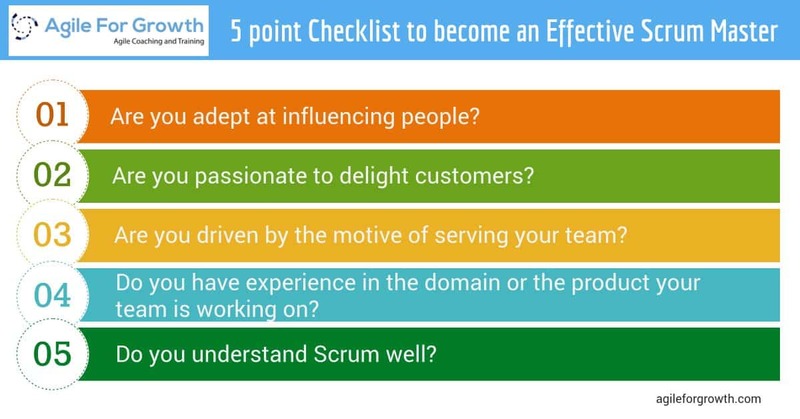 The Scrum Master coaches the development team to accomplish these four outcomes. The Scrum Master coaches the development team and the organization to transition from top-down and externally managed to a self-organizing team. The Scrum Master helps develop this vision of Self-Organization within the team. The SM creates an environment within which the team members can try smaller experiments to move towards self-organization. > Space and time for the development team members to step forward. To exercise the empowerment offered to them and assume the responsibility. Most Development Teams usually take time to migrate from one person having all the answers to let's find out the answer as a team. > To neutralize the external influences from the top-down organization. > To create a perimeter of the decisions that the team members can take themselves without having to go to others within the organization. The Scrum Master makes the team's efforts and progress visible towards becoming a self-organizing team. The Scrum Master coaches the Development Team members to acquire broader, cross-functional skills. The development team members move from being single function experts to become cross-functionally skilled members. Their skill evolution may look like a T-Shape, Pi Shape and eventually Broken-Comb-shape. At an appropriate opportunity, I asked the team - How is it (being single function focused) working for you? Single function expertise sounded efficient on the surface, however, it was causing local-optimization at the cost of reduced system-optimization. When asked, the Team members were quick to raise their observations and concerns. With single function focus, the team was producing a lot of waste in terms of hand-offs and waiting. Lack of collaboration was the norm. Some team members were always overloaded and others had intermittent work. With some further poking, asking clarifying questions, and allowing them to create a vision of betterment, the team members came together to script a better future for themselves in terms of cross-functionality. The first milestone they set for themselves was to broaden their focus and to be able to work on at least two functions in next 4 months. Team members self-selected the area which they wanted to learn. Some started collaborating with BAs to learn more about the domain and customer collaboration, others started working with QAs to get better at verification / validation and some leveled up to create wireframes and learn the UX design aspects. I facilitated the environment, movement of desks, additional white-boards, and flip charts etc to enable opportunities for collaboration, pair-programming and sharing knowledge. Soon, the team members started doing one-hour knowledge sharing sessions every Thursday afternoon. Team's slack now got an additional Knowledge Sharing channel where insightful articles, code snippets, and Tutorial videos were being shared. If the job of a good coach is to work themselves out of the job, then the Scrum Master must coach the Dev team to foresee and remove the impediments themselves. The Scrum Master coaches the team to practice it. Maybe mentor a bit in the beginning. This requires a bit of practice on part of the development team. To be able to shift focus from day-to-day tasks to step back and look at the action from ~10,000 feet and sense for patterns. A good Scrum Master may challenge the team members to figure their own version of approach to finding and fixing the impediments. Being Agile is a team sport. It requires intense collaboration among the team members. To rapidly deliver value in small increments, seek customer feedback and adapt to customer needs. The coach helps the team to embed collaboration in their ways of working, making decisions, planning and execution. > To improve Product Backlog Management efficacy. > To understand the empirical way of Product Planning. > To order the PB to maximize business value. > To understand and practice agility: The Scrum Master coaches the Product Owner to internalize the concept of agility and what being adaptable means. The Scrum Master holds the Product Owner accountable to identify market changes and adjusting direction to minimize risk and maximize ROI. One of the common dysfunctions I’ve witnessed with the Product Owners is the false certainty they bring to the development teams in the form of requirements. The underlying assumption is that if my team builds it, we launch it, the customer will pay for it. Jenny, what makes you say that the customer will pay for this feature? The coach may challenge the PO to distinguish between the user asked requirements and the hypothesis. The Scrum Master coaches the Product Owner to internalize the concept of agility and what being adaptable means. The Scrum Master holds the Product Owner accountable to identify market changes and adjusting direction to minimize risk and maximize ROI. To experiment small and adapt. The Scrum Master coaches the people in the organization to develop a learning organization that is flexible and adaptable to market changes. > Developing Agile Mindset throughout the organization. > Bringing the necessary changes in all the functions (HR, Marketing, Finance, etc.) of the organization to improve the flow of value. > Removing the functional silos to improve cross-functionality. > Building bridges of collaboration within the organization that make the hierarchy irrelevant. > Pave way for the organizational culture to be conducive to experimentation and adaptation. > Develop a learning organization. > Help the leaders identify System Optimization Goal for the organization. > Create a culture of investigating the root-causes and immediately acting to address them. What type of Coach is the Scrum Master? Back in days, when I was learning Coaching, I observed there are various types of coaches and coaching interventions. There are few dozen varieties of coaching and coaches. Some of the most commonly known coaches are Life Coach, Sports Coach, Business Coach, Leadership Coach, Behavior Coach, Strengths Coach, Career Coach, Relationship Coach, etc. I kept thinking and asking, which type of a coach is the Scrum Master? It turned out there was not a single type. As a Scrum Master, you'll find that the good Scrum Master's coaching styles, approaches, and techniques are similar to and a combination of these coaches. Most common application for the Scrum Master's coaching is to coach the Development Team. Usually, multiple team members are part of the intervention. This is pretty different from one-one coaching. The focus of team coaching could be for example to build a high-performance team. The Scrum Master acting as a team coach may help the team accomplish this by fostering collaboration, creating shared ownership and creating accountability within the team. The Scrum Master has to be comfortable coaching the individuals in 1-1 sessions. Particularly the Product Owner, and managers that have a high influence on the team. Also, any difficult to work with team member and team member who may be finding it challenging to keep up with the team's expectations may benefit from 1-1 coaching intervention with the coach. My reference for this type of coaching is the Co-Active Coaching model by Henry and Karen Kimsey-House. I've been fortunate to take Karen's workshop on Co-Active coaching in Boston. I found this out very early in my Scrum Master career that without invoking positive behavioral changes within the people, my efforts to serve the team in creating a high performing team will yield only limited and short-lived results. The behavioral coaching may not necessarily be called so and may be embedded within the Scrum Master's regular coaching interventions. From my experience coaching Scrum Teams and Agile Leaders, some of the behavioral changes desired by coachees have been: Moving from traditional control style to self-organization, from plan-it-all to being comfortable with iterative planning, from can't-fail to experimentation mindset, from someone will assign me the work to what can I do to help the team accomplish its goals behaviors. My role model to learn behavioral coaching has been Marshall Goldsmith. I've read 4 of his book and gifted those to about a dozen of my colleagues and friends. The Scrum Master as a coach to the managers and leaders is a key to bringing deeper changes within the organization and getting leadership support. If you as a Scrum Master have ignored this aspect, time to start thinking about it. Effective coaching for the leaders will significantly benefit your team see reduced resistance from the organization and increased support from immediate leaders. 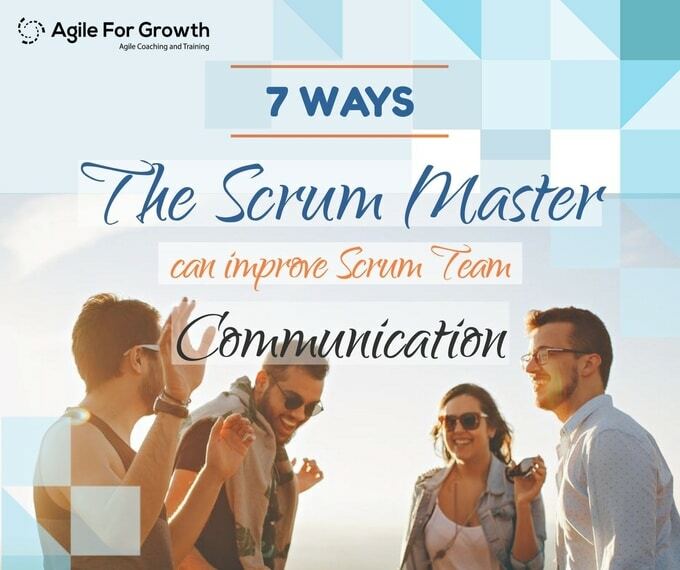 The Scrum Master may help the leaders adapt Agile mindset, remove confusion about the changes, bring clarity to their role during and after the change, and help the leaders with improving their leadership agility. I highly recommend Leadership Agility by Bill Joiner to improve your Leadership Agility as well as help your leaders. Like the Sports Coach, the Scrum Master aka the Scrum Coach's coaching is informed by her experience and expertize of Scrum Framework. At times the Scrum Coach may need to step in and share with the team about what is Scrum and what it is not. What practice may be added to the Scrum Framework and which practice may add waste to the process. Here the Scrum Master may take the mentor role and help the unaware people to become educated on a specific practice or rule of Scrum. Refer writing about the most successful Sports coaches like - John Wooden, Vince Lombardi and Phil Jackson. Being effective at coaching requires the Scrum Master to be able to find the most appropriate technique and style that fits the context and the Scrum Team's needs. Scrum Master must develop a wide array of coaching skills to be able to pull one out on the fly. 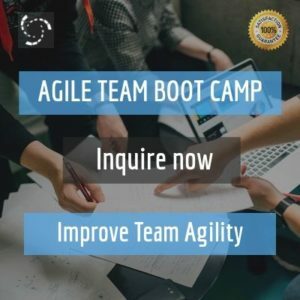 A plethora of dozen a dime Agile Coach certifications are now available by various organizations today. To improve the selling ability of these certifications, each one has launched their versions of the terminology referring to the Coaching aspect associated with Scrum Framework and Being Agile. In its most fundamental and simple state the Scrum Master should be empowered enough to be able to coach (as discussed above) the development team, the Product Owner as well as the Organization - that the leaders within the organization, their decisions, the organizational structure and associated policies and the organizational cultural aspect. 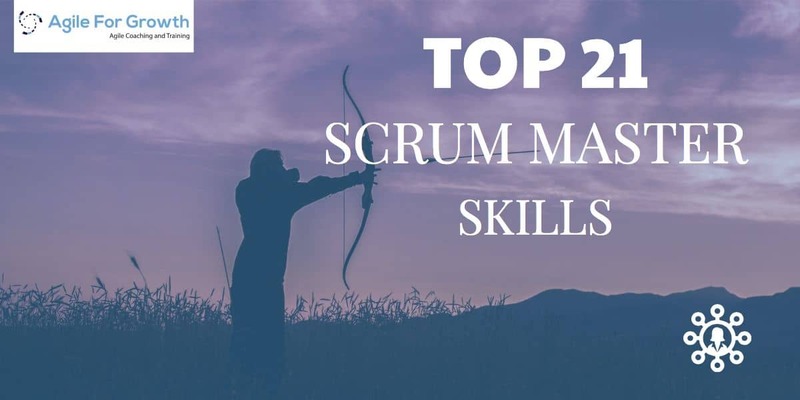 However, in traditional hierarchical organizations, it is highly uncommon for a Scrum Master to be able to get regular time and visibility with top decision-makers of the organization. Without much empowerment, these Scrum Masters can only fantasize about coaching their leaders. This dysfunction is much bigger and a tough one for these Scrum Masters to be able to address. Also wouldn't it be too low for a Vice President to get coached on Enterprise Agility by a Scrum Master who may be 8 levels below them in the organization chart? Such situation has given a rise to different levels of coaches in such organizations. Most commonly used terms for the experienced Scrum Master acting as a Coach in the Scrum and Agile industry today is Scrum Coach and Agile Coach. Newer variants you may also hear these days are Team Agile Coach and Enterprise Agile Coach, etc. Accept it or not, if someone keeps calling them as a Scrum Master for 10 years, industry today will not value or respect them as much as they would to someone who calls them Enterprise Agile Coach having only 2-years experience in the industry. In an efficient organization, there would be no need for 3-5 levels of Scrum Masters to Enterprise Agile Coaches. The Scrum Master should be empowered enough to work with the organization, help bring up organization level impediments, work with leaders, and contribute to policy changes required etc. Rants aside, if you are hiring Agile Coach whether at a team level or at an Enterprise Level - first you want to see if the person brings hands-on experience working as a Scrum Master. I prefer 5 years minimum Scrum Master experience before a person can really get the handle of the vast field and impact an Agile Coach can create on the teams and enterprises as Systems. There is no fixed duration. Each Scrum Master learns at their own pace. It may take anywhere from 2-6 years of dedicated learning + practice to develop a good range of coaching skills. A good reference in this field is the ICF (International Coach Federation) - the most widely recognized body of Executive, Business, and Life Coaching. The entry-level - Associate Coach takes roughly 1-2 years. The third-level - Master Coach may take up to 8-10 years in the journey. However, what is most important to become a great coach is to get started on your learning path today. Remember the Chinese saying? - "The best time to plant a tree was 20 years ago. The second best time is now." Scrum Masters - Servant Leadership is one aspect that can set an effective Scrum Master apart from the pack. Are you looking to be an effective Scrum Master? In this in-depth guide, I explore the Scrum Master as a Servant -Leader, Servant-Leadership with the context of the Scrum Master role, the characteristics of a Servant-Leader and how you can apply these characteristics to become an effective Scrum Master. A Servant-Leader desires to serve. A Servant-Leader serves first. This behavior is opposite to a traditional manager’s style which is to Manage/Lead first. A Scrum Master is a Servant-Leader. Scrum Master serves the Team’s agenda, helps them grow and succeed. Servant Leadership is a philosophy and set of practices that are based on serving and caring for others, to lead. Servant Leadership behavior creates a more just and caring world by enriching people and building better organizations. The Servant-Leader is servant first. It begins with the natural feeling that one wants to serve, to serve first. Then conscious choice brings one to aspire to lead. That leader significantly differs from one who is leader first, may be due to the need to acquire power, material belonging, control and authority within the organization. The leader-first and the servant-first are two extreme leadership styles. There are a variety of shades between these two styles. Robert Greenleaf popularized the Servant Leadership movement in 1970 through his article – The Servant as Leader. In which he coined the words "Servant-Leader" and "Servant Leadership." How is Servant Leadership useful in the application of Scrum framework? First, the 5 Scrum values - Openness, Respect, Commitment, Courage, and Focus, align well with the philosophy of Servant Leadership. It's about your character and behaviors. How you practice what you preach to your people. Do you respect your people, show openness while listening to their ideas, display courage in keeping their needs ahead of yours etc. The Scrum Master becomes the role model of practicing the Scrum Values and serves the team to be able to practice the same. Second, The Scrum Master plays a key role in the success and failure of any team's Scrum implementation. Scrum Guide specifies that the Scrum Master is a Servant-Leader for the Scrum Team. This is about people and serving them so they can grow and succeed. As part of the Scrum Master’s role, the Scrum Guide lists the Scrum Master’s service to the Development Team, the Product Owner, and the Organization. Scrum Master serves these roles to help them meet their goals and become successful. Third, Scrum Master facilitates building a high performing team. The team model in Scrum is designed to optimize flexibility, creativity, and productivity - let's call it effectiveness. - The Scrum Guide. The Scrum Master helps create this vision of a high performing team. The Scrum Master helps remove impediments, shields the team from interruptions, helps them stay focused, and empowers them to make progress towards a better future every Sprint. Fourth, Scrum is a team sport. Self-Organization and Team Collaboration are essential elements for the success of any Scrum implementation. This is practically not achievable in the presence of top-down, command-oriented management, and functional silos within organizations. To enable self-organization teams must be free from a central point of authority. In the absence of any organizational authority and power, the Scrum Master allows space for the development team to self-organize. The Scrum Master is a Servant-Leader for the Scrum Team – Scrum Guide. To encourage Servant Leadership behavior, the Scrum Master role by design does not have organizational authority or power. The Scrum Master is not a boss or an alternate title for a manager of the team. The absence of organizational power, allows the Scrum Master to establish Psychological safety within the team. Which in turn empowers the team members and allows them to self-organize. If the Scrum Master possesses organizational power, that limits the chances of establishing a safe environment. A Servant-leader Scrum Master creates an environment where people can contribute and flourish. An environment where people are cared for and feel safe to express themselves. An environment where they've enough empowerment to make necessary decisions. Scrum Master is that leader for the Scrum Team. Who does the Scrum Master serve? The Scrum Master serves the Development Team, the Product Owner, and the Organization in their endeavor to apply Scrum and get benefits from it. A Scrum Master with her leadership enables the Scrum Team to become High Performing Team. Such that it can rapidly adapt to the changing customer needs and solve customer challenges. If you are a Scrum Master who also happens to have organizational authority - aka responsibility of product delivery, the team members reporting into you, you make financial decisions, you write performance reviews, etc. observe your behavior closely. If asked, will my colleagues and team members say that I serve them? Whose agenda do I serve? Theirs or mine? Am I able to justify the responsibility as a Servant-Leader Scrum Master? How does Scrum Master's Servant-Leadership style work with traditional managers? The paradoxical style of Servant Leadership is difficult to enact for the traditional managers. Most managers tend to be comfortable with the leadership aspect, but not the servant aspect. It's not uncommon for novice Scrum Masters to restrict themselves to being the servant or secretary of the Scrum Team. First time and particularly untrained Scrum Masters typically limit their focus on setting up the meeting invites, arranging supplies, jotting down the meeting minutes, updating team's tasks on the task board, creating reports and sending out communications on behalf of the team members or PO etc. They mostly miss exhibiting the leadership aspect. It doesn't have to be this way. What do experts say about Servant Leadership? a) Do those who are being served grow as persons? b) Do they, while being served, become healthier, wiser, freer, more autonomous, more likely themselves to become servants? c) What is the effect on the least privileged in society? d) Will they benefit or at least not be further deprived?" The servant leadership is not about being submissive, letting go or giving in. It is about the genuine interest to serve others. ...the Journey to the East story clearly says: the great leader is seen as servant first, and that simple fact is the key to her/his greatness. Leo - the character in the story, was actually the leader, all the time, but he was servant first because that was what he was, deep down within. Leadership was bestowed upon a man who was a servant by nature. Leo was a servant first. Another very insightful observation by Greenleaf is that Servant-Leaders are Self-Aware. "Awareness is not a giver of solace. It is just the opposite. It is a disturber and an awakener. Able leaders are usually sharply awake and reasonably disturbed. They are not seekers after solace. They have their own inner serenity”. From a Scrum Master's perspective, Servant Leadership is about identifying and serving the needs of the Team and the Stakeholders. The characteristics of Servant leadership are inherent to some people. These characteristics can be further learned and such behaviours can be refined through practice. How to apply Servant Leadership in my role as a Scrum Master? If you want to become effective at the Scrum Master role, you may begin with asking: How can I develop Servant-Leadership skills? For Scrum Masters to display Servant-Leadership, it is essential to develop and practice Servant-Leader behaviors. Below 8 Servant-Leader behaviours combined make them highly relevant for the Scrum Master role. Applied to any team and organisational environment, these Servant-Leadership behaviours transforms the organizational culture to a caring, safe and high-performing culture. As a Scrum Master, you do not have any authority in the organization. You derive influence from your subject matter expertise of Scrum and by having the heart to serve your team and care for them. As a Servant-Leader you seek to empower the team members and invite them in decision making. Your behaviour is of serving and caring. It enhances the growth of team members while improving the caring and quality of organizational life. Is your emphasis on serving your team-members for their good and not just the good of the organization? If yes, then you sure are one effective Scrum Master. Are you concerned about the success of all stakeholders? Broadly stakeholders include employees, customers, business partners, communities, and society, including those who are the least privileged. Servant-Leader Scrum Masters believe that team members have an intrinsic value beyond their apparent responsibilities as employees. These Scrum Masters are deeply committed to the development and growth of each and every Scrum Team member. During my work as a Scrum Master, I aimed to nurture the professional as well as personal growth of team members I worked with. Let me share the story of Pat. Pat was one of our team members who had excellent business analysis and customer interview skills. Pat was going through some emotional challenges with his new wife. I invited him for a coffee one day. We briefly discussed his situation. I asked Pat, if he wanted my help? Pat showed interest and we setup time for three coaching sessions. We mutually agreed that the coaching will be intended to focus on how Pat can become aware of and possibly change his behaviour. During our second session, I offered Pat to take a quick assessment to become aware of his own emotions. To understand the range of his emotions and what behaviour/situation, triggered the positive emotions and what triggered the negative emotion was first step. Now Pat's aim was to identify the positive emotional triggers while he was with his wife and prolong those. Where as any triggers causing negative emotions and trauma were to be narrowed in duration and limited in intensity as much as possible. It wasn't easy or quick, however Pat was determined to change his situation. Becoming aware of his emotions empowered him to identify how he can best deal with the circumstances. Pat would try to build up whenever he experienced positive emotions such as Joy, Hope, Pride, Inspiration, Awe, Gratitude, etc. There are wide variety of opportunities where you can help your team members develop professional as well as personal capability and grow. Think about what opportunities within your team exists this week where you can help your team members grow. A Scrum Master as a servant-leader uses his capabilities and skills to help the team establish their agenda. The Scrum Master serves the team's agenda, not her own. The Scrum Master does not impose any directions or mandate upon the team. A Servant-leader Scrum Master instead, believes in Change by Invitation. She invites the team to choose the goals and the direction. She invites team members to opt in to participate and keeps options open for anyone to opt out. It is important to understand that if a person is titled as a Scrum Master but also carries traditional manager's responsibility to deliver a release, or to manage the team members etc, she'll not be able to truly serve the team's agenda. Such person will almost always end up making others follow her direction and agenda that she sets. There is also a boundary to serving team's agenda. For example: If a Product Owner's agenda is to finish certain number of features by this Sprint however the team clearly sees that as not practical. Though you want the Product Owner to succeed, however, in such situation it your responsibility to shield the Development Team from the excessive pressure of the Product Owner. Often Scrum Masters give-in to the pressure and allow the PO to overload the Dev Team. In any of the situation, can you say the Team's Agenda was served? Establishing and nurturing long-term relationships with all stakeholders, keeping the team-members in focus, helps them meet their fullest potential. If you are genuinely serving, caring and helping your team members grow, building relations with them will not be an issue. To build longer term relations, you would need to forgo short term approach/gains and allow for the things to settle. Healthy relations with the team creates a synergy among the team-members and boosts team's performance and growth. Is your emphasis on building long term and healthy relationships? If yes, you are on track. Like a good leader, the Scrum Master stays humble and practices regular self-reflection. Counter to a traditional leader's pride, servant leaders exhibit humility in their behaviour. Servant leaders don’t think less of themselves they just think of themselves less. They have high self-confidence but very low situational confidence. If they are faced with a situation, their response would most likely be: I have the intellect to solve all the problems, but I don’t have all the answers and for that I need other people’s brain. In today’s world where there is so much information and so many tools, its important to acknowledge that one person cannot know everything and that everyone needs or at some time will need his/her team members' help. A servant-leader will not take pride in the moments of success but will surely accept errors in times of failure. Your people are going through change all the time. There is uncertainty, and failures. Some of your people may have bruises. Many of them may go through emotional turbulences. Are you able to emotionally heal them? Offer your support? As per Tuckman’s Team Development development model, team go through Forming, Norming, Storming and Performing phases. While your team is going through Forming, Norming and Storming phase of the team development, as a Scrum Master, are standing by your team during this time of change? As a Servant-Leader, any emotional healing and support that you offer can go long way in building an environment of trust and care within the team. Being Empathic involves deeply connecting with the emotions of the other individual without judgement and critique. It is an essential behaviour of Servant-Leaders. Empathy starts with listening. Genuinely being present in the moment with somebody and listening with your whole self helps understand the other person's situation. Here the aim is to slow down and listen with the intent to understand the meaning behind the words, meaning of what is being felt, and what is not being said. Empathy connects two people by heart. Connecting with someone by heart is much more powerful than connecting only through brain. For Scrum Masters who are not naturally empathic (count me in with you), being aware of and caring about others' emotions is the starting point of developing empathy. Empathically listening to what your team members say and acknowledging what you sense+hear. Elena, you seem to worried. How can I help? David, I hear you are concerned about Matt's behaviour. What would you like to happen? When you lend someone your empathic ears, they get it. They feel safe and comfortable to share even more. Scrum Master through Empathy builds relationships, heals the team members, earns trust and gains influence. The moral component of the Scrum Masters must be strong. Being ethical relates to the way in which a servant-leader makes choices, disciplines herself and chooses the right thing to do in the service of the team. The Scrum Master may also encourage the team to self reflect and establish high standards of moral and ethical behaviour. The team members constantly observe the moral basis of the servant-leader's actions and organizational goals and relate to them. If you as a Scrum Master have ingrained integrity and professionalism in yourself, it'll be possible to bring it in the team. Often times, the Scrum Master may realize that the team needs to mature and they must be empowered, educated to handle their own meetings, hold each other accountable, collaborate with users and PO and deliver value. And time comes when the Scrum Master may not be providing the best value for the team and hence should decide to either step down from that role or move on. Displaying this high level of ethics and courage to step down from one's role, to let go, is the best way you can become really effective at performing the Scrum Master's role. What are the responsibilities of a Scrum Master as a Servant-Leader? Setting up Scrum framework in the service of the team, not as a way to commanding or micro-manage. Empowering and Guiding the Development Team on self-management. Leading the team through healthy conflict and debate on ideas. Teaching, coaching and mentoring the organization and team in adopting and using Scrum. Shielding the team from disturbances, external influences, and potential threats. Helping the team make visible, remove and prevent impediments. Encouraging, supporting and enabling the team to reach their full potential and performance. Nurturing a collaborative, supportive and empathic culture within the team. Constantly keeping the team challenged and away from mediocrity. Ensuring development, growth, and happiness of team members.